When we look at the actions we engage in as an assembly, tasting is a rather specific one. It is one of the few actions that relate to one part of the Mass. The action of tasting reminds us that “in the liturgy the sanctification of humankind is signified by signs perceptible to the senses” (Constitution on the Sacred Liturgy, article 7). Christ makes himself present to us through our simple gifts of bread and wine. These gifts change in substance, that is, they become the Body and Blood of Christ, but to our senses of touch, taste, smell, taste and hearing, they bear the appearance of the food and drink Christ shared with his disciples at the Last Supper. “Holy Communion has a fuller form as a sign when it takes place under both kinds. 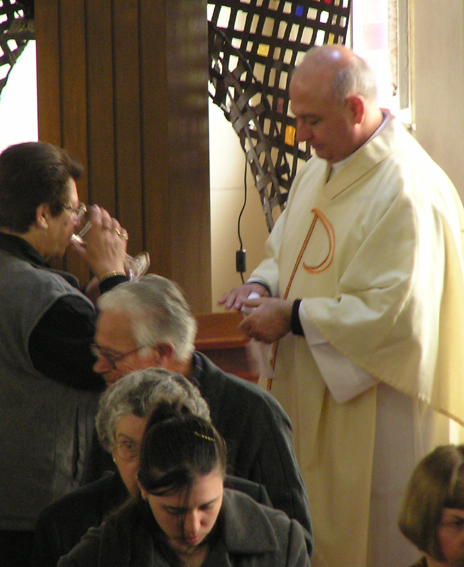 For in this form the sign of the Eucharistic banquet is more clearly evident and clearer expression is given to the divine will by which the new and eternal Covenant is ratified in the Blood of the Lord, as also the connection between the Eucharistic banquet and the eschatological banquet in the Kingdom of the Father” (article 281). Again, while we acknowledge our limitations before receiving Communion, saying “Lord I am not worthy that you should enter under my roof…”, Christ, through his grace, invites us to receive him under the ordinary forms of bread and wine; to “taste and see that the Lord is good” (Psalm 34:8).